Though carebears have a lot of different complaints about me, one of the most common is that I "hide in an NPC corp" which cannot be wardecced. This particular whine is so common that it has its own square on Miner Bingo. I have always been very clear on the fact that I do not "hide" anywhere, from anyone. I fear nothing. That's one of several advantages of being Invincible. I am a warrior, and I accept all requests for 1v1 duels, provided they are properly invoked under the Code. 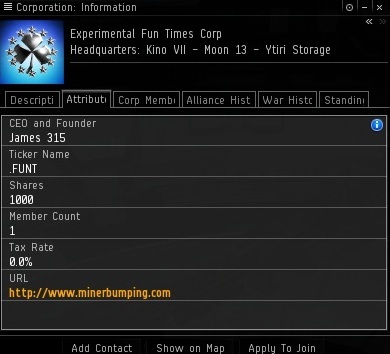 This corporation was created in Kino, where I happened to be docked the last time I was bumping miners. I am the only member. Don't bother sending in applications; I won't be reviewing or accepting them. The logo is faintly reminiscent of that of the highly-acclaimed Yet Another CAOD-Inspired 1-Man Alt Corp corporation which, during the summer of 2007, was all the rage in the Corporations, Alliances, and Organizations subforum on EVE-O. But that's history, and we're interested in the future. 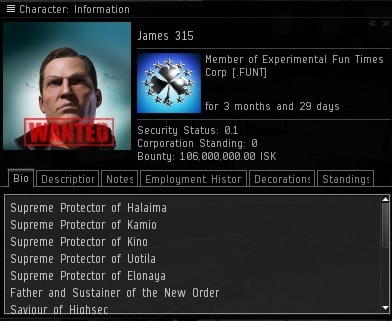 What is the purpose of this new corp? It is part of a special project, which will remain classified for the time being. 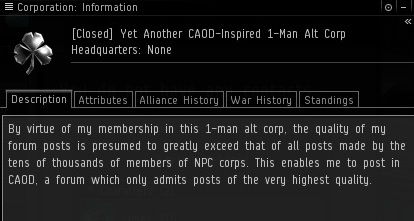 One thing's for certain, though: Rebellious miners can no longer complain that I am in an NPC corp and unwardeccable. Does this mean they will launch wardecs, or will they simply find something else to complain about? I'm guessing the latter, but only time will tell. Ok .. its not a big number for james315 but I'm a poor newbee and subgenius priest. I will kill you in an empty clone and we did 50:50 ? Putting Bounty on someone is so ... i have no words, did they understand the rules ? .. My problem aren't the 3 Questions, my problem is.. i can't even fly a stabber around the block. Don't worry it's just a question of time an i will declare the holly war of the SubGenius vs. people who has more ISK than me. 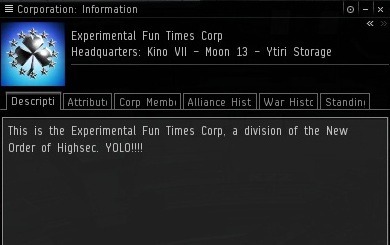 You really didn't have anything more intelligent to write in your corp-bio than YOLO? I am disappointed, James. I thought you were better than that. Well it was kind of a spur of the moment type of thing.